Once the holiday season comes around, food blogs and websites are abundant with beautiful pumpkin recipes. Pumpkin pie, cake, muffins, bread…. I think pumpkin is one of the best comfort foods. Even the uber-snooty Blair Waldorf makes humble pumpkin pie on Thanksgiving day! It’s quite the universal vegetable…eaten all over the world; sweet and savory; as a side or as a main. And of course, no other vegetable can spell fun the way a pumpkin does, when Halloween comes around bringing grinning jack o’ lanterns on windowsills. I miss Halloween. Not because of the candy, but because for me, that was when pumpkin season really started…jack o’ lanterns, then pumpkin pie at Thanksgiving dinner and spiced pumpkin cake around Christmas. I enjoy it the simplest way; as mathanga olan or stew, with coconut milk and curry leaves. I took my mom’s already simple recipe and simplified it further. Real olan has black-eyed beans in addition to pumpkin; I left it out. 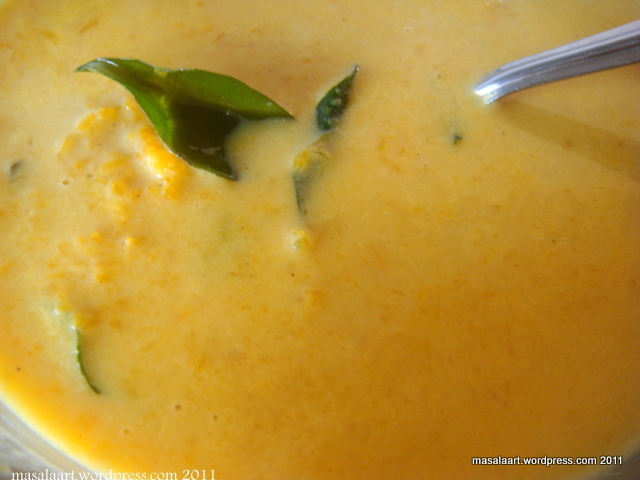 Sweet, velvety pumpkin in a creamy coconut milk stew flavoured with black pepper and curry leaves. That’s it. I really wish I could have managed a better picture because this one just doesn’t do it justice. Oh well. Try it out, your tastebuds will not be disappointed! Steam or pressure cook the pumpkin with a teaspoon of turmeric and salt (to taste) and keep aside. In a non-stick pot, heat the coconut oil. Once hot, add the black pepper and curry leaves and swirl around so that the flavours are released. Add the cooked pumpkin and stir gently. Next, add the coconut milk, a little at a time, and continue stirring gently. Add the water, allow to simmer for a little bit and add some salt. Take off heat. Serve with steamed rice. OMG Sounds so good ! gona try for sure !